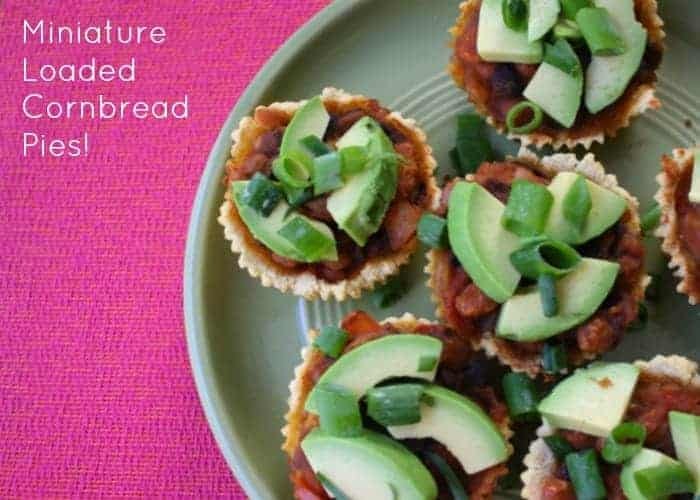 These mini cornbread pie cups, filled with bean stew and topped with avocados are perfect gluten-free snack or appetizer! We are really keeping this “miniature versions of things” ball rolling over here! I shared a recipe for Miniature Chocolate Cheesecakes, and today it’s time to whip out that muffin pan again! This time, we’re making a mini cornbread pie recipe packed with a smoky bean filling and topped with creamy avocado slices. 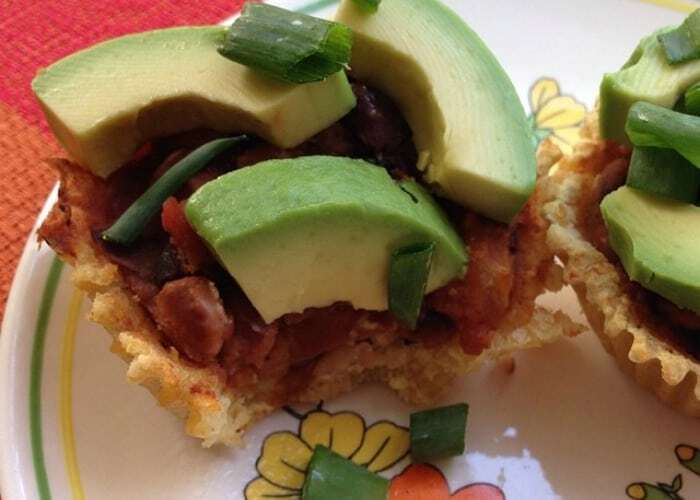 Start with gluten-free cornmeal cups. Then you pile on a deeply seasoned bean stew and finish it off with fresh avocado and spring onions. Usually, recipes like this are topped with cheese, but these pies use avocado to add a little richness and offset the savory dough and filling. 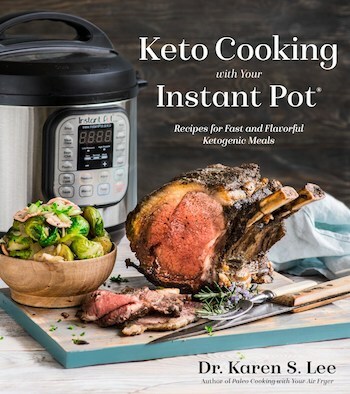 phytosterols – These healthy fats are anti-inflammatory, and there’s even research showing that phytosterols can help people suffering from arthritis. 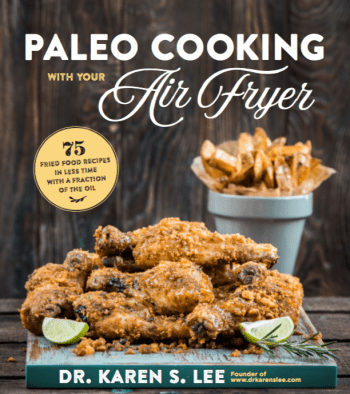 polyhydroxylated fatty alcohols (PFAs) – You normally find PFAs in sea vegetables, and avocado is one of the few dryland foods containing them. PFAs provide even more anti-inflammatory benefits! oleic acid – This is the same fatty acid that makes olive oil so healthy. It can help reduce the risk of heart disease, and it helps us absorb essential nutrients like carotenoids. It’s that balance of fats and avocado’s high concentration of carotenoids that makes it so perfect. Usually you get carotenoids like beta carotene from orange veggies, but avocados are loaded with them! And because it also gets around 50% of its fat content from oleic acid, it helps your body absorb those beneficial nutrients. Oh also, avocados are freaking delicious. Let’s eat some on top of a mini cornbread pie! Or 12! 4 cups of cooked beans or 2 15 ounce cans - I used a mix of black and pinto beans, but you can use whatever you have handy. Preheat the oven to 350F, and line a 12-cup muffin pan with paper liners. In a large bowl, combine the cornmeal, broth, and shortening. Your goal here is a malleable dough that's between the consistency of pancake batter and bread dough. Shapeable, but not runny. Divide the dough between your muffin tins, pressing it down into the bottoms and up the sides. You basically want to make little cornmeal dough "cups." Make sure there are no holes in the dough, because you want the cups to hold the filling (see the second photo above). It takes more dough than you'd think to get solid cups with no holes. You're going to use every last bit of the dough, so scrape the bowl, and fill those cups! Set the muffin pan aside. In a Dutch oven or small saucepan, heat the oil on medium, and add the onion and garlic. Cook until the onions soften. Add the vinegar, spices, beans, tomato, and broth, and cook, stirring, until the tomatoes soften and the sauce thickens. Think chili. This takes about 12-15 minutes, depending on how moist your tomato was and what sort of beans you use. Just keep stirring until you have a nice thick stew. Season with the salt and pepper. Use the bean mixture to top off your 12 muffin cups, and bake for 20 minutes. You will probably have some leftover bean mixture, and that's OK! This stew freezes well. Stick it in the freezer, and pull it out to use as a taco stuffing on an evening when you don't have time to cook. 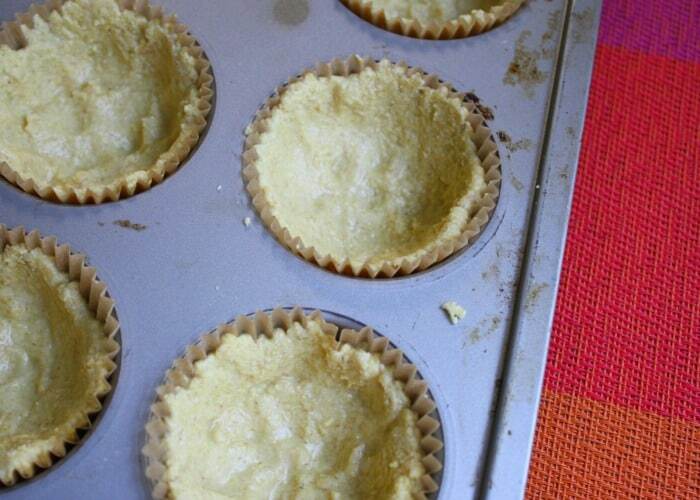 Let the batch of mini cornmeal pie cool for about 5 minutes before you pop them out of the muffin pan. Top each pie with a nice-sized slice of avocado and a little bit of green onions, and set them out for your guests to devour!